Ellie started to play the cornet at the age of 7 with Launceston Juniors and by 8 was playing in the senior band. She moved to the flugelhorn soon after and the highlight was playing at the National Finals in 2012 when she was 11 years old. In 2013 she moved to Bugle band under Jeremy Wilcock and spent a happy couple of years in the 2nd section taking every opportunity to improve her playing. Ellie joined St Dennis in June 2015 following in the footsteps of Zoe Hancock, who tutored her at National Children’s brass band in 2014 and who has since become a huge support to her on all aspects of her playing. Her first 15 months at St Dennis have been unforgettable winning the areas, Bugle and the 1st section National finals as well as being honoured to be part of the band to play for the Queen at Poundbury in October 2016. She’s very much looking forward to the challenge ahead at St Dennis on their return to the Championship section in 2017 and beyond. 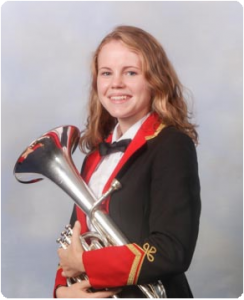 Ellie is also a member of the National Youth Brass Band of Great Britain and the Cornwall Youth Brass Band and previously the National Children’s Brass Band of Great Britain. Outside of band she’s currently a student at Okehampton College and plays trumpet in the college Big Band as well as the piano. She spends the rest of her spare time travelling to band! Francesca started to play the Cornet at the age of 8 Years Old. She progressed through the Learner, Junior and the Youth Bands and finally made it in to the Senior band in the Year 2000. Since then she has occupied 3rd Cornet, Repiano and Principal Cornet. During this period Francesca was also Principal Cornet the Youth Band where she was very much part of the Band’s success. 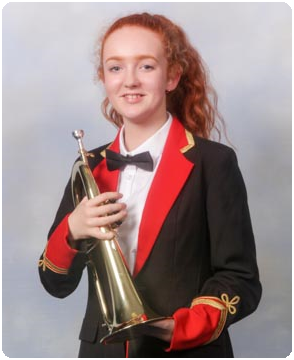 Francesca has been awarded many individual awards with St Dennis Band and is now enjoying the challenge of playing Solo horn for the Band which she switched to in the early part of 2010. One of Francesca’s greatest playing memories was performing as part of the winning performance of Resurgam with the Youth Band at the SWBBA contest in 2006. Rebecca joined the St Dennis Youth Band in 2006. She has completed her grade 5 Music Exams and receives private tuition from Amelia Commons. Rebecca joined the senior band in May 2014 on 2nd horn. Her Dad Colin is the bands Bass Trombonist.